Gujarat currently accounts for 1,152 mining leases as on March 2011 out of a total of 11,003 mining leases, which comes to nearly 10.47 per cent of the country. The total mining area in the state (except for fuel and atomic minerals) is spread over 30035.65 hectares. The authors of the report, whose Gujarat part has been prepared by state civil rights activist Ashok Shrimali, believe, that the situation is particularly grim, as limestone, one of the principal mineral for cement industry required for construction, is currently totally administered at the state level. Apart from limestone, Gujarat has large reserves of bauxite, lignite, gypsum, agate and dimensional stone and a few other minor minerals. 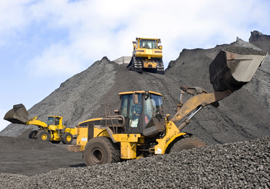 Kutch, Amreli, Jamnagar, Junagarh and Porbandar have large number of leases of bauxite and limestone. The third eco-sensitive zone is Vansda national park, which is contiguous to the Western Ghats. The report says, according to “directions” for this zone, in the area up to five km from the boundary of the protected area no mining and crushing is allowed. Only quarrying of sand for local use in Tapi and Navsari districts in river beds is permitted in consultation with the state forest and environment department. The report underlines, “As they also trade in these minerals, it is particularly important and necessary that the spirit of Samta Judgment be followed as it is much valid in modern circumstances where conflicts are rising and the coinciding laws like Panchayat (Extension to Scheduled Areas) Act (or PESA), and Forest Rights Act are kept primary to showcase constitutional duty by enabling regulations and rules to accomplish the directive principles as enshrined in the Constitution of India”. The report gives the instance of mining in Tadkeshwar village, which is situated in Mandavi taluka of Surat district, where lignite mining project is introduced by the Gujarat Mining Development Corporation. “Dilemma to part away with land with meagre compensation as well as coping with guarded environment during public consultation (public hearing) has put the community in tremendous pressure. On top of this, mining project there is also an express highway proposed that will demand more land from the same village community”, the report says.